SAN FRANCISCO -- Audi is rolling out technology that will allow its vehicles in the United States to communicate with traffic signals, allowing for a more stress-free ride in what it says is the car industry's first commercial use of the technology. Audi of America, which is owned by Volkswagen Group, said select Q7 crossover and A4 sedan models built after June 1, 2016, will be equipped with its vehicle-to-infrastructure technology. Known in the industry as "V-to-I," the technology allows traffic signals and other infrastructure to exchange safety and other operational data wirelessly to vehicles over the cloud. Eventual applications of the technology, which continues to be tested across the globe by carmakers and transportation agencies, will help mitigate crashes and reduce congestion on roads and highways. "This is our foray into V-to-I," said Pom Malhotra, general manager of Audi's connected vehicles division. "This is designed not as a safety feature but a comfort and convenience feature." Audi's system allows the vehicle to display a countdown before a red light turns to green. Knowing how much time one has before the light changes to green will relieve much of the anxiety of waiting, Malhotra said. Future applications of the technology could see it linked to the car's navigation system or its stop/start functions. Another possible eventual use is that traffic signals could advise the vehicle to keep to a certain speed in order to match the flow of traffic lights, executives said. Audi plans to roll out the capability in five to seven U.S. cities this year, with cities to be switched on one by one. The company would not disclose which cities would be first. 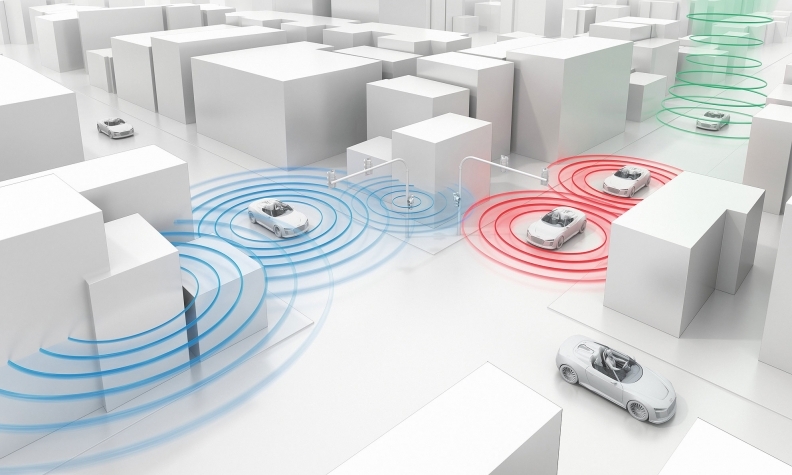 Carmakers are trying to leverage technology -- including vehicle-to-vehicle communications ("V-to-V") allowing cars to talk to each other -- to reduce accidents and improve congestion. Deploying such systems is a challenge because both V-to-I and V-to-V technologies require not only secure communications infrastructure, but close cooperation with municipalities and transportation agencies.